Peter and Jeff first came to us back in 2001 when they needed a simple Web site to communicate their corporate message to potential manufacturer clients. Years later, we had an opportunity to give that initial Web site effort a new look and feel. Peter Cunningham and Jeff Miller, owners of Cunningham Manufacturers Representatives, has two large locations in Southern Texas with business and warhorse space in both locations. 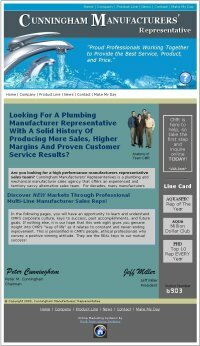 Peter’s Web site is used primarily to attract plumbing and mechanical manufacturers that are looking for a new agency to represent their product in Peter and Jeff’s area. CMR opened their Internet doors in 2001 and almost a decade later, they have a new updated look that sends a more powerful and direct message to potential manufactures in need of an outside sales agency.